I’d been through this three times before, but needed to gather my inner strength to approach the process again. The act of matriculating a child into college calls for foresight and patience, and guarantees the addition of more than a few gray hairs. Guidance counselors usually push teens to get involved around the junior year of high school, perhaps earlier. Why, some parents even plan the choice before the child is born. The road to enrollment follows a jagged course; one that bumps along, occasionally hitting potholes like SAT tests, college visitations and those dreaded application essays. (AutomotiveTraveler.com readers may recall my somewhat ill-fated spring break odyssey two years ago.) Once the admissions paperwork is submitted, relax and idle the engine while waiting for a green light. Will the checkered flag of acceptance unfold or the agony of rejection? 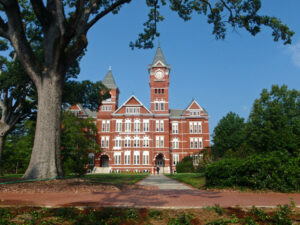 By the end of the senior year, the path narrows, a selection is made and deposits sent. Post graduation plans include road trips to orientation and shopping for what my daughter calls necessities: extra-long organic sheets, memory foam mattress topper, futon, flat screen TV, coffee maker, i-Pad, computer and books. Seems she slants towards conspicuously posh. And so last Thursday, my husband, daughter Laura and I made final preparations. Our car(s) were jammed like the Beverly Hillbillies, albeit with higher priced items. Laura packed clothing for every imaginable occasion and essentials for the entire freshman class; and then, she crammed in a little more. Hubby Jay would drive our BMW along the 350 mile sojourn to Auburn University in Alabama and I would follow in Laura’s car. About two hours into the trek, we entered Interstate-75. Suddenly, a warning light alerted Jay to low tire pressure. (Yes, the car was unusually weighted down.) He maneuvered onto the highway shoulder and I proceeded likewise. Whoa, one of the rear tires was a shamble, a near blow-out. Thank goodness, he avoided an accident. Getting to the spare tire, hidden in the lower well, required the removal of all the suitcases, duffels, lamps and assorted items stashed within the trunk (think– a garage sale on the side of the road). No sooner had the bags been unloaded when it started to rain. Alas, the travel gods were not happy, opening the clouds with a torrential downpour; the type that stings worse than a failing grade. Jay quickly restashed the luggage and called BMW Assist. A decision was made for Laura and I to proceed on while dear old Dad stayed behind to mount the spare, then purchase a replacement tire at the BMW dealer in Albany, Georgia. This plan safely brought us all to our destination by nightfall. Funny, but one of Laura’s classmates, who was also in transit, sent a text message saying her Mom was nabbed for speeding. As I mentioned, the fates were swirling that day. Next morning dawned hot and humid with overcast skies. The heat index called for another 100 degree scorcher; after all, this was Alabama in August. We followed university directions and unloaded the immense pile of belongings at 11 am. 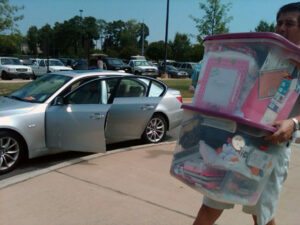 Then I, and a number of other Moms, guarded the stacked assemblages as the cars were parked. When Laura entered the dorm to check-in, we discovered a wrong key had been given out earlier in the morning. 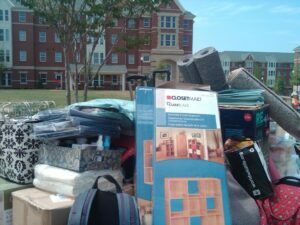 A student who was not supposed to move into the assigned four-girl suite had already done so. What?? And another suite mate had moved into the side where Laura and her roommate were to share the space. Much confusion followed and move-in came to a stand still. Read – I sweltered in the sun waiting with the bags. Just when I thought I would expire, we got the go-ahead to haul her belongings to a lobby. We paced and waited for the resident director to sort out a solution. This was our chance to meet Laura’s roommate and her parents, who were the epitome of southern charm and easily rolled with the drama. Finally, at 2:00, we began to fill Laura’s new digs. 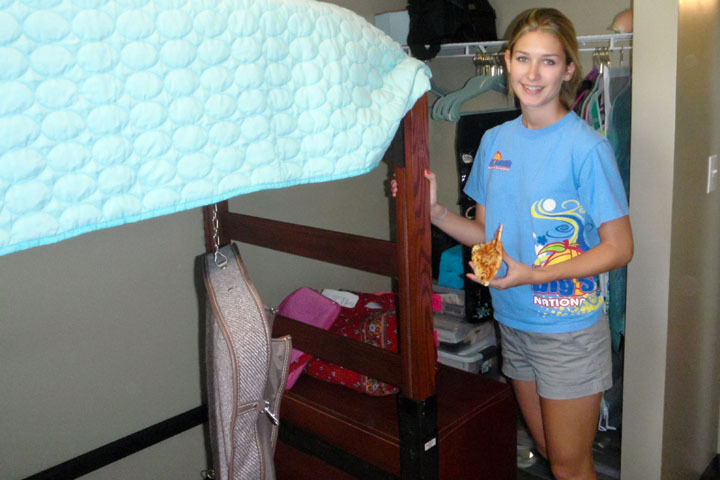 She had chosen a lofted bed; one which Auburn hires installers to construct– of course, at added expense. Long gone are the days when my sons used concrete blocks to raise the beds in their dorms. By now the atmosphere has transformed from high anxiety to family friendly; parents planned future tailgates and football weekends. 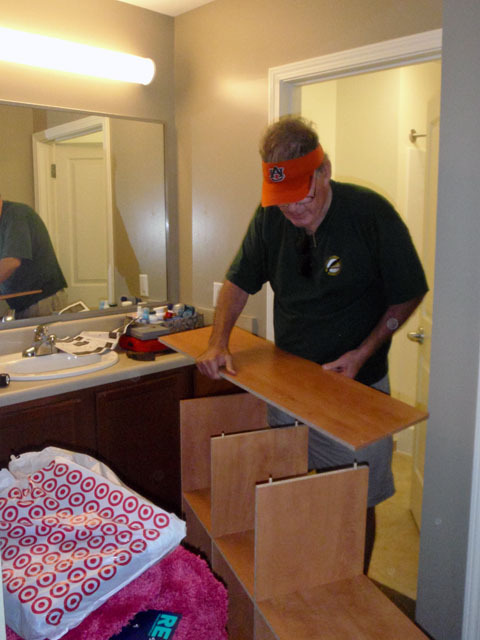 Jay was in charge of piecing together modular storage units, a project reminiscent of Christmas Eve toy construction. The Moms made a run to Wal-Mart. By 6:30 pm, we’d all had it; dinner and drinks called. Shortly thereafter we left for the six-hour journey home. The desired transition was not what you’d call stress-free or uneventful, but our daughter was officially a college coed with a school address. That meant we were empty nesters. For the first time in 36 years, I did not have a child living at home. Stepping back to pre-parenting days afforded a sense of relief and freedom, but leaping forward left me with an empty laundry hamper and a permanent wrinkle in my aching heart.